This study was intended to assess the role of ICTs in utilization of teff technologies in Enebsie Sar Midir district. Simple random sampling procedure was used to select three kebeles and 136 households. Questionnaire and observation were used to collect data. Descriptive statistics like mean, percentage and frequency and univariate analysis such as t-test and chi-square tests and binary logistic regression model were used to analyze the data. Network interruption, language problem and usage difficulty were among the challenges not to use mobile phone. Interruption of electric power and information being not area specific were some challenges not to use radio and television for teff technologies. Construction of infrastructures, provision of adult education and trainings for farmers, introduction of Amharic language enabled mobile phones is very useful for increasing information and communication technologies use in teff technologies and hence increase teff production. Agriculture is the main economic sector in Ethiopia and the majority of the rural population depends on it. The major constraints that affect agricultural extension indirectly are the high cost of inputs, lack of inputs, late delivery of inputs, weak seed systems, transportation problems with the input system, monopolies on input markets, and lack of communication and information sharing between research and extension and within the extension line ministries from the federal to the kebele levels. The subject matter specialists have very limited or no linkages with research and educational institutions or with other sources of essential technical and marketing information, due to inadequate ICT capacity. ICTs can play an important role as enabling tools when addressing these challenges or constraints (Davis et al., 2010). Among the many institutional support services that need to catalyze/support the transformation process, the agricultural extension service plays a critical role, since it contributes to the development of the skill, knowledge and change the outlook of farmers to adopt improved agricultural technologies (seed of varieties and animal breeds, implements, chemicals and practices), and the approaches and processes with which the skill development and access to information are realized (Berhanu et al., 2006). Modern agriculture is characterized among other things by the significant role of communication as factor of change and progress. Electronic media transmit the agriculture innovation to the farming community. Undoubtedly, there has been a rapid quantitative diffusion of mass media. The primary conveyors of development information in agriculture are also the persuasive agents of change in rural areas. Communication of development information; and equally persuasive conveyors of change, is the development workers: extension agriculture personnel in agriculture. A third source of development information is influential opinion leaders. Agriculture development is the need of time for a better and prosperous nation (Jan et al., 2011). ICTs can play an important role in bringing about sustainable agricultural development when used to document both modern and traditional cultivation practices. Information Technology (IT) could act as a bridge between traditional and modern knowledge systems (Meera et al., 2004). Recent development in ICT that make it particularly relevant for the dissemination of innovations include: its interactivity, speed, and links between different media and the internet, ease of use, portability, declining costs, and increased storage capacity. ICT can aid the innovation-diffusion process of agricultural innovations by providing necessary information in a convenient and timely manner, in a variety of forms to suit a variety of users’ needs (Arumapperuma, 2008). 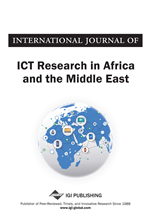 The rapid spread of ICTs in developing countries over the past decade offers a unique opportunity to transfer knowledge via private and public information systems. Over the past decade, mobile phone coverage has spread rapidly in Africa, Asia and Latin America. Farmers can obtain information from a number of sources, including, among others, their own trial and error and from members of their social network. Yet while traditional economic theory assumes that searching for such information is costless, in developing countries, in reality, information is neither symmetric nor costless. This is partly due to the cost of obtaining that information via personal travel, radio, newspaper, which can be relatively expensive in the context of limited infrastructure and vast distances (Aker, 2010). Teff (Eragrostis tef) is a highly important crop to Ethiopia, both in terms of production and consumption. In a country of over 80 million people, teff accounts for about 15% of all calories consumed, mostly used to prepare injera. Its nature to be drought-resistant and adapted to a wide range of agro-ecological conditions, teff is popular among farmers. However, when grown under the current traditional management practice teff is a labor-intensive crop because of the high rates of cultivation and weeding required (Bekabil et al., 2011).